The Republic of Ireland will face Wales on Monday with automatic World Cup qualification still possible after two Daryl Murphy goals sealed victory over Moldova. Serbia, who suffered a last-gasp 3-2 defeat by Austria, lead Wales by only a point, with the Irish a further point adrift and only Monday's Group D fixtures remaining. After Wales's victory in Georgia earlier on Friday, the Republic had to win and were always in control after Murphy volleyed the opener after two minutes in Dublin. His magnificent header doubled the lead after 19 minutes. Which teams have qualified for Russia 2018? The eight best second-placed teams from the nine groups enter the play-offs, and victory in Cardiff will guarantee Martin O'Neill's side second spot. However, if Serbia lose at home to Georgia, the Republic - ranked 34th in the world - would top the group with victory over Wales. Republic boss Martin O'Neill announced on Thursday that he had agreed a new two-year contract, and Friday's result keeps alive his hopes of a second successful qualifying campaign. O'Neill caused something of a surprise by handing a first competitive start to Callum O'Dowda but the Bristol City winger vindicated his selection with an energetic and skilful display. With James McClean suspended, O'Dowda, 22, was preferred to the more experienced Aiden McGeady and his calmness in possession and strong running gave the Republic an alternative creative outlet to Wes Hoolahan. In between Murphy's goals, a brilliant O'Dowda run and pass set up a glorious chance squandered by Shane Long. O'Dowda's display means he must be in contention to retain his place in Cardiff despite McClean and Brady returning from suspension. With Jonathan Walters unavailable because of injury, Murphy was picked to partner Long in attack. The Nottingham Forest striker's second international goal - volleyed home after Moldova failed to deal with a Stephen Ward long throw - was the perfect start for the Irish. Murphy produced a perfectly placed looping header to give the Republic breathing space after Hoolahan's magnificent diagonal ball was followed by Ward's cross to the back post. In contrast to his strike partner, Southampton's Long had another frustrating evening as his failure to take three clear chances extended his barren run for club and country to 24 games. He fired badly wide in the 15th minute after being set up by O'Dowda and was denied by keeper Ilie Cebanu before the break. Long's frustration was obvious in the 61st minute after he prodded wide with Cebanu out of position after O'Dowda's shot had been blocked. Keeper Darren Randolph made a superb diving save to tip over a Sergiu Platica shot in the first half to preserve the Republic's 2-0 lead. Moldova, ranked 156th in the world, dominated much of the second half but lacked punch up front and their night ended on a sour note as midfielder Alexandru Gatcan was dismissed in stoppage time after thrusting his head towards Republic substitute Harry Arter. Republic of Ireland manager Martin O'Neill: "We went to Lille having to win to get into the last 16 (against Italy at Euro 2016) and we did it, so let's go for this. We know what we have to do now. We have to win a game in Cardiff. "We did fine in the first half, got an early goal and followed it up with a great goal from Murph. Second half, we probably took our foot off the pedal, but it was all about winning the game and it sets us up nicely for Monday night. "We have some pretty decent players coming back. James McClean has been fantastic for us in this tournament and Robbie Brady is a very, very good player so it is pretty interesting for Monday now." 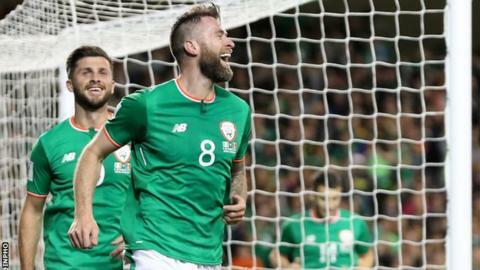 Republic of Ireland goalscorer Daryl Murphy: "I was confident going into the game after scoring for my club this season and I wanted to repay the manager for his faith in me. "It's a big night for me. To score two goals, I can't ask for any more really. "We always knew that we needed to win these two games. Monday is massive. We will be ready." After losing against Serbia in their previous home game, the Republic of Ireland maintained their record of having not lost back-to-back home games in competitive action since 1972. Martin O'Neill's team have scored four goals in the opening five minutes of games in 2018 World Cup qualifying; the most of any European team. Match ends, Republic of Ireland 2, Moldova 0. Second Half ends, Republic of Ireland 2, Moldova 0. Alexandru Gatcan (Moldova) is shown the red card for violent conduct. Foul by Alexandru Gatcan (Moldova). Harry Arter (Republic of Ireland) wins a free kick on the left wing. Harry Arter (Republic of Ireland) is shown the yellow card for a bad foul. Jeff Hendrick (Republic of Ireland) wins a free kick on the right wing. Alexandru Epureanu (Moldova) wins a free kick in the defensive half. Foul by Sean Maguire (Republic of Ireland). Attempt missed. Gheorghe Anton (Moldova) right footed shot from more than 35 yards is high and wide to the right. Assisted by Artur Ionita. Foul by Eugeniu Cociuc (Moldova). Jeff Hendrick (Republic of Ireland) wins a free kick in the attacking half. Substitution, Republic of Ireland. Sean Maguire replaces Shane Long. Substitution, Moldova. Vladimir Ambros replaces Sergiu Platica. Substitution, Republic of Ireland. Harry Arter replaces Daryl Murphy. Substitution, Republic of Ireland. Aiden McGeady replaces Wes Hoolahan. Sergiu Platica (Moldova) wins a free kick in the defensive half. Foul by Callum O'Dowda (Republic of Ireland). Attempt missed. Eugeniu Cociuc (Moldova) right footed shot from outside the box is high and wide to the right. Assisted by Sergiu Platica. Attempt missed. Shane Duffy (Republic of Ireland) right footed shot from the centre of the box is too high following a corner. Attempt blocked. Ciaran Clark (Republic of Ireland) header from the left side of the box is blocked. Assisted by Wes Hoolahan with a cross. Corner, Republic of Ireland. Conceded by Sergiu Platica. Corner, Republic of Ireland. Conceded by Alexandru Epureanu. Attempt saved. Eugeniu Cociuc (Moldova) right footed shot from outside the box is saved in the centre of the goal. Assisted by Radu Ginsari. Attempt missed. Shane Long (Republic of Ireland) right footed shot from the centre of the box is close, but misses to the left. Attempt blocked. Callum O'Dowda (Republic of Ireland) right footed shot from the centre of the box is blocked. Assisted by Wes Hoolahan. Attempt missed. Sergiu Platica (Moldova) header from the centre of the box misses to the left. Assisted by Eugeniu Cociuc with a cross following a corner. Corner, Moldova. Conceded by Ciaran Clark. Attempt blocked. Daryl Murphy (Republic of Ireland) header from the centre of the box is blocked. Assisted by Wes Hoolahan with a cross. Corner, Moldova. Conceded by Stephen Ward. Substitution, Moldova. Eugeniu Cociuc replaces Alexandru Dedov. Sergiu Platica (Moldova) wins a free kick in the attacking half. Ciaran Clark (Republic of Ireland) wins a free kick in the defensive half. Corner, Moldova. Conceded by David Meyler. Vitalie Bordian (Moldova) wins a free kick in the defensive half. World Cup 2018 - who has qualified? Read more on World Cup 2018 - which 32 teams have qualified for Russia?